Pah! The iPhone game you play with your mouth. No? Yeah, me neither. But hey, go with it. Pah! is a classic sidescroller for iOS, with one big ol’ twist: it’s played entirely with your mouth. From the start screen on down, you play via a series of “Pah! Pah! Pah!”s and “AaaaAAAAaahs”. 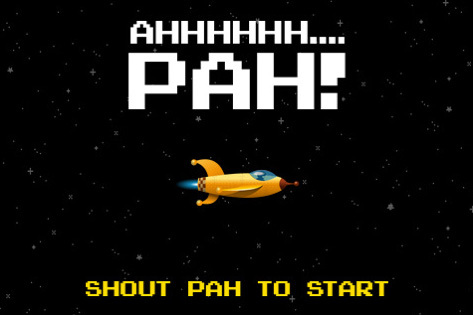 Shouting “Pah!” fires your ship’s guns, while the pitch of your “Aaah” determines how high you fly. Don’t expect it to rock your world with mind-blowing graphics or an epic narrative — but at just 99 cents [iTunes Link], it’s worth checking out for the laughs alone. Check out a video of the game after the jump.